To find out more about cookies, visit www.allaboutcookies.org. To find out how to enable cookies or change your settings, click here. SalarySearch is a unique online resource with up-to-date pay and benefits data for over 600 jobs across the UK. 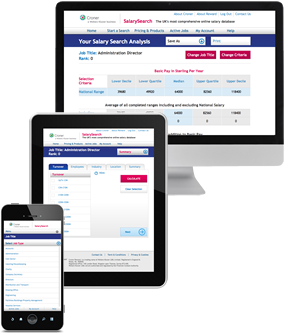 SalarySearch is one of the UK’s most comprehensive online salary benchmarking tools. It can help you make informed decisions around pay, benefits and total reward on an individual, departmental or organisation-wide basis helping you retain and attract quality employees. After recent development SalarySearch is now easier to navigate, provides results faster and is readable on Smart phones and tablets so you can now truly access the tool 24/7. Compiled using data collected through Croner Reward’s continuous research in to pay and benefits across the UK SalarySearch is updated quarterly providing you with the most up to date and reliable data available. Roles from within your organisation can be compared against the external market using 600 job titles, 10 different job bands, 8 turnover bands, 7 employee bands, 10 UK regions, 68 UK counties, 75 UK towns and 34 industry sectors. And because of our specific methodology, there are no data gaps, ensuring you get a robust answer no matter which combination or criteria you choose. An organisation’s most valuable asset is its human resource. One of the key issues to staff retention and recruitment is offering the correct remuneration and benefits package. SalarySearch is the vital tool required to ensure your organisation does just that. The pay data held in this comprehensive benchmarking tool is collected from employers throughout the UK, the results are then checked and analysed by Croner Reward. Providing you with the most up-to-date and reliable information possible means you can reward and retain current employees as well as attracting new employees and because of our special methodology your search will always produce a result, ensuring no data gaps whatever criteria you choose. SalarySearch has been redesigned and is now more efficient, accessible and easy to use than ever, meaning accurate pay and benefits information is just a few clicks away. Croner Reward is a trading name of Croner Group Limited registered in England & Wales. No. 8654528. VAT Number 173 1676 02. Registered Office: Croner House, Wheatfield Way, Hinckley, LE10 1YG. Croner Group Limited is authorised and regulated by the Financial Conduct Authority.